Here are some of the highlights from the October 6, 2012, Today’s Homeowner with Danny Lipford radio show. Lawn and garden writer Julie Day Jones shared some October tips to put into practice Around the Yard. Danny and Allen discuss some smart yard cleaning techniques to keep raking from becoming a pain in the back. 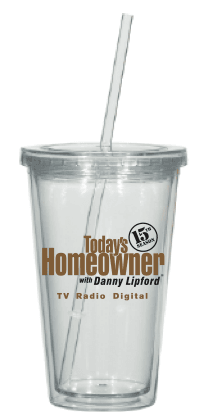 This week, five lucky listeners will win a Special Edition, 15th Season Today’s Homeowner Tumbler! Just phone in a home improvement question to the Today’s Homeowner Hotline at 1-800-946-4420. We’ll select five questions in a random drawing to receive one of the great glasses. How to find a ceiling leak after a heavy rainstorm. Are there products to spray on a roof that prevent black roof algae. How to seal cracks in siding to prevent water infiltration. Do the vents in vinyl soffit need to line up with existing soffit vents. How to keep a groundhog away from a manufactured home. What type of wood is best to use when building a gazebo. Creating a screened room under a wood deck. How to improve the taste of water in your home. Are LED recessed lights worth the extra cost. How to hide the nails on the top row when installing fiber cement siding. Can HVAC ducts made of duct board be cleaned of dust. Problem with replacement door weatherstripping not fitting. How to prevent dirt from washing through a retaining wall. Installing wood flooring over carpeting. How to clean vinyl siding without using bleach.